How much external noise can you add to a wetland environment before the wildlife inhabitants really start to suffer? Relatively little scientific research appears to have been conducted on this subject. Yet an understanding of cumulative noise pollution is essential to properly assessing the long-term impact of the proposed St. Marys Cement under-the-lake mine south of Bowmanville. A recently published research paper found biochemical markers of increased stress levels, as well as reduced hatching success, among birds chronically exposed to industrial noise. We’ll get to that paper below, but first, here’s a refresher on the setting for the mine proposal. The St. Marys mine proposal (official Project Description here) describes a mine-entrance tunnel near the bottom of the existing limestone quarry on the Lake Ontario shoreline. The tunnel will lead to under-the-lake caverns, which will be excavated over a 100-year period. The project site is adjacent to two Provincially Significant Wetlands, Westside Marsh and Bowmanville Marsh. These wetlands are among the remnants of what was once a very extensive array of coastal wetlands all around Lake Ontario. The remaining coastal wetlands are still of key importance to resident and migratory bird populations and to many freshwater fish species who depend on the wetlands at some stage of their life-cycles. If the project is approved as proposed, 4 million tonnes of limestone will be blasted and hauled out from these caverns each year. The operation will require ventilation fans moving fresh air into the mine and exhaust air back out, to enable work to be conducted throughout a network of chambers that will eventually extend approximately 14 square kilometers under the lake. Mining trucks will carry the limestone out of the mine and into the quarry, where it will be crushed into aggregate suitable for construction use. Then approximately 500 truckloads per day (based on seven days/week haulage) will leave the St. Marys site carrying aggregate to the primary market on the east side of the Greater Toronto Area. The environmental viability of the project must be assessed by looking at the cumulative effects. The blasting, drilling, ventilation fans, trucks and crushers will add noise to an environment that is already anything but quiet. At present both Westside Marsh and Bowmanville Marsh are subject to significant anthropogenic noise levels on a 24-hour basis. The operations of St. Marys are just one component of that noise. 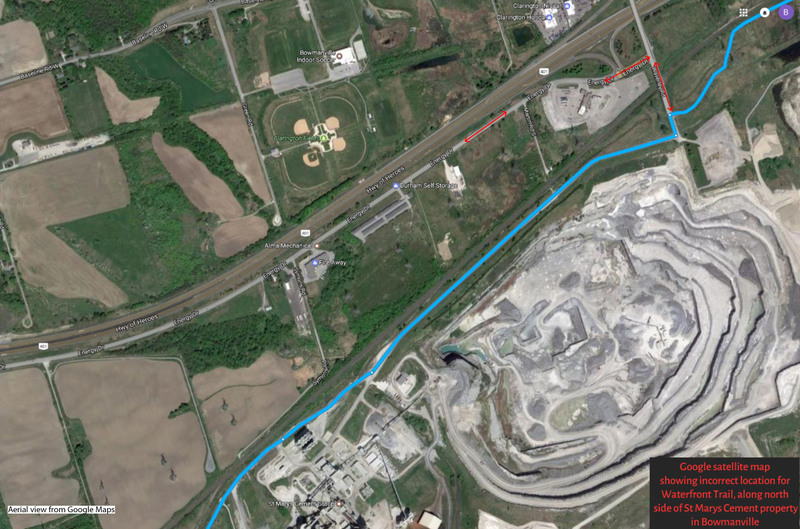 Noise from St. Marys existing operations comes from blasting and hauling limestone immediately to the west of Westside Marsh, trucking of cement products, and major excavation and berm-building directly north of Westside Marsh. One of the busiest rail lines in Canada passes directly north of the quarry, about 500 meters north of Westside Marsh, and through the north end of Bowmanville Marsh. Above, an eastbound CN freight train skirts the St. Marys quarry and cement plant. Below, a CN freight train on the bridge over Soper Creek at the north end of Bowmanville Marsh. To date, no studies have simultaneously examined relationships among noise, GCs [glucocorticoids], and fitness in animals that settle and breed in natural areas exposed to chronic anthropogenic noise. The paper looked at three species of cavity-nesting birds with different noise tolerances, in a New Mexico wildland which is now interrupted by an array of natural gas compressors. The evidence “strongly suggests that chronic anthropogenic noise induces stress and hypocorticism in birds.” Furthermore, with one of the studied species, the western bluebird, increased noise was correlated with a lower rate of hatching success. There are a number of explanations for the stress response. At lower exposure levels, anthropogenic noise is more likely to elicit stress responses indirectly by increasing the difficulty of coping with external challenges (e.g., territory defense) or by creating anxiety through reduced detectability and predictability of threats (e.g., acoustic masking of predator alarm sounds), or both. Given the capacity for chronic noise to consistently mask biologically relevant cues, animals living in areas with high levels of noise may fail to receive information about their local habitats, leading to a continual state of perceived unpredictability and reduced security. Citing a range of other studies, the authors further explain how chronic noise pollution disrupts the normal sensory perceptions of wildlife. The distance over which birdsong and other sounds are effectively transmitted, their ‘active space’, is significantly reduced by increases in ambient background noise. Anthropogenic noise, acting as an acoustic blanket, can reduce or inhibit detection of hetero- and conspecific vocalizations that birds and other animals use to gain information about predation threats. For example, the presence of birdsong and chatter is thought to signal the absence of nearby predators. How does noise pollution affect the wildlife in Westside and Bowmanville Marshes? Are there species which would otherwise make these wetlands home, if it weren’t for chronic noise levels? With increasing noise levels, will some of the existing species be driven out, or will the populations be weakened due to lower reproduction rates? These are complex questions – but they must be answered before the impacts of additional noise, due to a major mining/extraction project, can be properly assessed. In spite of huge environmental challenges these wetlands remain home to a wide variety of species. Within this small area there are cattail marshes, open water, wetland forest, upland forest, and even a small fen. Among the many species that live here are various waterfowl, fish, wading birds, osprey, kingfisher, beaver, muskrat, and predators including otter, weasel, marten, raccoon, coyote and fox. These wetlands are also vital staging areas for the many migratory birds which fly over Lake Ontario in the spring and fall. Raccoon on the bank of Westside Creek at the north end of a beaver pond; ospreys which nest each year on platforms in Westside Marsh; juvenile Black-Crown Night Heron photographed in Bowmanville Marsh. These wetlands are officially designated as “Provincially Significant Marshes”. The review process for the St. Marys under-the-lake mine must make us ask, how much significance does the province actually afford to this environment? In this era of unprecedented, large-scale human-driven environmental change, preservation or recovery of natural acoustic conditions should be a key aspect of conservation planning and is a critical step toward successful conservation of protected species. Given the importance of natural acoustic conditions to conservation planning, should the province of Ontario give the OK to increased noise pollution from St. Marys Cement? St Marys Underground Expansion: Will a mine be a good neighbour to a marsh? Where do you draw the line between “moderate” and “significant” environmental effects? Are the dust and diesel emissions from a large mining operation likely to affect the health of an adjacent wetland? In the case of the St Marys Underground Expansion proposal, those questions would appear to be closely linked. The St Marys Underground Expansion has been slotted as Category C. The determination that the project will have only “moderate potential environmental effects” appears to be based substantially on the claim that nearly all of the activities will take place underground, and the surface footprint of the current operation will not change. But the Project Description doesn’t give serious consideration to the cumulative effects of limestone dust and diesel emissions produced by a doubling of the scale of the extraction activities. The St Marys operation in Bowmanville is adjacent to a conservation area which includes two marshes – the Westside Marsh and Bowmanville Marsh. Both are designated as provincially significant wetlands, and both are downwind from St Marys when the prevailing westerly and southwesterly winds are blowing. Graphic adapted from Bowmanville Expansion Project Description, page 12. The lines at bottom marked “Declines” represent the tunnels in and out of the proposed mine. The current quarrying operation takes out about 4 million tonnes of limestone annually, and the underground mine is projected to take out an additional 4 million tonnes. The initial plans call for mining and primary crushing to take place underground. All the air that is pumped into the mine will be pumped back out via the exhaust tunnel. There is the potential for dust produced underground to come out with the exhaust flow; the Project Description gives little detail on how dust will be managed. There will be additional processing of the mined limestone above ground, so there is the potential for more limestone dust being swept up in the wind. Last but certainly not least, several hundred trucks per day will be required to haul the limestone off to market – at 20 tonnes per truck, the 4 million tonnes per year would fill 200,000 trucks. How can we be sure that the dust and diesel particulate emissions from all this crushing and trucking will have no “significant environmental effects” on the adjacent marshes? The Project Description neither asks nor answers this question. In a table discussing Potential Project Effects, the document repeats the same basic phrases in regards to “Areas of ecological importance, including protected areas”, “Views or aesthetics”, “Aquatic species or habitat”, “Terrestrial species or habitat”, “Endangered species”, “Migratory bird species”, “Surface water quality”, and “Soils – contaminants, sedimentation, erosion”. Regarding all these concerns, the Project Description says there will be no significant effects “since all activities will occur beneath the bed of Lake Ontario or within the existing licensed quarry area”. It is important that in the next phase of the project screening, the possible effects of emissions get more attention in order to ensure that years of marsh rehabilitation work do not go for naught. But CLOCA reports also make clear that a lot of improvement is needed. A 2006 report indicated that the wetland areas of Westside and Bowmanville Marsh both ranged from “poor to good health”. A 2014 Public Information Centre on Bowmanville Marsh Restoration reported “submerged aquatic vegetation and amphibians in poor condition”, and “birds in fair condition, but showing signs of decline”. Frogs are thought to be especially sensitive to environmental contaminants, and frogs are remarkably scarce in these marshes now. How much more air-borne pollution will settle in the marshes due to a doubling of heavy equipment emissions at the adjacent quarry/mine? Will frogs, other amphibians, and the many other inhabitants of the marshes be affected? If the Bowmanville Underground Expansion goes ahead, will “All living things enjoy the protected, tranquil area of the Bowmanville/Westside Marshes”? Snapping turtle at edge of Bowmanville Marsh, June 21, 2015. Top photo: St Marys Cement quarry and kiln, February 14, 2016. St Marys Cement environmental assessment: does climate policy matter? A proposal to excavate hundreds of millions of tonnes of limestone from beneath Lake Ontario raises many questions, starting with a big one: should we be planning for the continued expansion of the concrete industry, given what we already know about climate change? While concrete is one of the most important and ubiquitous materials in modern life, the cement industry is a major source of greenhouse gas emissions, accounting for 8% of global carbon emissions (Macleans, 7 March 2016). The emissions occur because when limestone is cooked to transform it into cement its natural carbon content is released, and because it takes prodigious amounts of heat to effect this chemical transformation. That is why the St Marys plant in Bowmanville burns both coal and bitcoke (the black powder left over from bitumen after refining) by the shipload. Not only is cement production carbon-emissions intensive, but the way we use cement tends to encourage further carbon emissions. The biggest share of cement in Ontario goes into concrete pavement which is used to widen roads and add new parking lots – which in turn promotes greater use of cars and trucks. Which brings us back to the St Marys expansion plan. The company is not saying it will expand its cement production in Bowmanville, but the additional limestone will most likely be used with cement. For further clarity, the limestone extracted from under Lake Ontario will be marketed in industry parlance as “aggregate” – what most people refer to as gravel. And that aggregate will mostly be mixed with cement, to form concrete, or used as a base layer underneath slabs of concrete. In other words, the quarrying of limestone for aggregate will complement St Marys core business of quarrying limestone for cement. The key phrase here is “given expected levels of economic and population growth”. If the economic trends of the past 20 years continue on the same track for the next 20 years, aggregate use will go up by 13 per cent – from 164 million tonnes per year to 186 million. In other words, if we continue Business As Usual, we will need more aggregate. How is this aggregate used? In recent decades the area of pavement has grown faster than the population has grown, because urban sprawl has been the dominant form of development. If we project that “Business As Usual” scenario into the next generation, we’ll need to build a lot more roadway, we’ll need a lot more aggregate, and we’ll need a lot more cement. But the “Business As Usual” scenario collides head-on with Canada’s official climate policy commitments. Although no one thinks we can or should stop using cement (or fossil fuels) tomorrow, it is clear that we should be making every effort to reduce our carbon emissions immediately, and reduce those emissions at a faster rate with each passing year. That means we should be planning to reduce, not increase, the role of car-dependent sprawl in our urban developments; reduce, not increase, the amount of new pavement we place atop our land each year; and reduce, not increase, the amount of cement we need to cook up and mix with aggregate for concrete each year. The Business As Usual scenario means we don’t take seriously the climate science consensus that continued growth in carbon emissions will be catastrophic for our grandchildren, and we don’t take seriously our government’s commitment to an economy-wide reduction of emissions. When this Environmental Assessment process gets underway, will St Marys be required to show that the expansion project is consistent with Ontario’s and Canada’s official climate policies? Stay tuned. Top photo: The Peter Cresswell docked at the St Marys Cement port on Lake Ontario near Bowmanville.